Allspice plant has deliciously aromatic leaves and seeds used to flavour meats, pickles etc. The flavour of Allspice, Pimenta dioica, can best be described as combination of nutmeg / cinnamon / cloves. Traditional Caribbean folk use of the leaves and berries as a remedy for anxiety and indigestion. Rare. A warm climate plant. 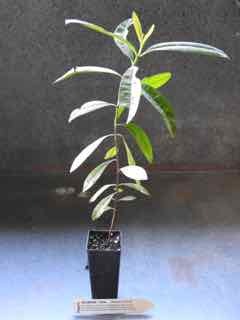 Allspice plant is native to Central America and prefers well composted, light to medium, moist, well drained soils in a protected, sunny position. Drought and frost tender. A dioecious, evergreen tree growing to 10m x 5m. Be the first to review “Allspice, plant” Click here to cancel reply.